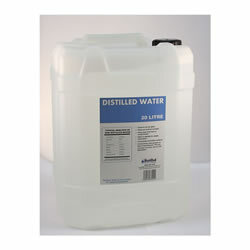 Need distilled water, bottled, but haven't got a distiller? This could be just for you! This distilled water is packaged in non-tainting plastic containers. The plastic containers we use are food grade and the distilled water is medical grade. The food grade containers can be recycled by customers after the distilled water is finished. Dentistry, Medical, Laboratory, Photography, Aquariums, Bubble Fish Tanks, Ironing, Colloidal Silver making, Computer component cooling, Cigar Humidors, Allergy Testing, refilling Automotive batteries and much more. To ensure product quality, samples are taken from various stages of production and consistently monitored on every batch produced, as well as strict in house systems. We use third party UKAS accredited analytical testing to validate our distilled water. For customers who are required or wish to show appropriate due diligence in product selection we offer compliance certificates of our list of standards to support your processes. This certificate of conformity is valuable information for your records, and is currently issued monthly and free of charge. This type of certification is batch specific but may not match the exact batch you take delivery of. For absolute critical applications we offer a premium product / certified by batch service. If this is of interest we will need to know the volumes you require, specific use, standard required and product shelf life. Observe use-by dates. Store containers sealed away and away from sunlight, heat, frost, moisture, chemicals or contaminants. Store at 15 - 25 degrees Celsius. Please note any water unused or left in opened containers degrades rapidly and increases in conductivity as it absorbs trace elements and carbon dioxide from the atmosphere. Price includes VAT & delivery within mainland UK only. The 10 litre plastic containers - Jerry Cans - we use are non-tainting, food grade. 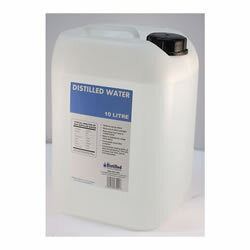 The Distilled water we supply adheres to medical grading standards. The food grade containers can be recycled by customers after the distilled water is finished. What's the difference with water from a domestic water distiller? A domestic distiller unless regularly cleaned and serviced can allow impurities into the water produced. For more info about why distilled water is so good please read link near the bottom of the page. Q. Why can the water bottles be stored for a limited period of time? Over a period of time the plastic bottle will leach solids into the water. So we only recommend a 6 month shelf life to ensure 0 parts per million Total Dissolved Solids. We are only being cautious, so it will probably be ok for longer. Also once opened, gases from the air will be absorbed by the water increasing the chemical content. Q. Is this water the same as the water available in chemists / petrol stations? No. This is not de-ionised or reverse osmosis water. This is water which has undergone a distillation process; using Commercial Water Distillers that are regularly cleaned and maintained. Normally delivery within 2- 5 working days . Normally delivered within 2 - 5 working days . Please include 'Bottled Distilled Water' in subject line of e-mail.